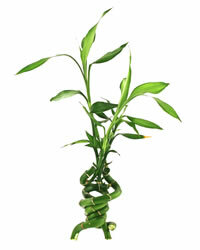 If you are looking for information on care for indoor bamboo plant it will usually mean you have a Lucky Bamboo plant. Although strictly speaking Lucky Bamboo are not true members of the bamboo family... they are not even related! Lucky bamboo do resemble real bamboo, and have very similar characteristics, but in reality they are a tropical house plant type called Dracena and part of the Lily family. It is relatively straightforward to learn how to care for Lucky Bamboo and even if you do not have very much experience of looking after house plants they do have a reputation for being easy to care for and maintain. Because of this easy to care for reputation, and the different arrangements that you can buy, they are popular in both the office and homes where people may not be able to provide them with such regular maintenance. The uniqueness of the unusual arrangements and shapes of these indoor plants means that yours will be unique and they can often be the topic of conversation. They are not so widespread as to be common enough for everyone to have seen one yet. One of the things that make Lucky Bamboo good is that they survive very well in conditions of low lighting and do not need a lot of sunlight. As with other tropical plants, a sixty five to eighty degree range of temperature provides an ideal environment for them to thrive in, just like an office or home. It makes it even easier to care for them as they are able to grow with small amounts of water and without any soil at all. This trait is once again backing up the reputation for ease of care and maintenance. You can grow them in vases and jars made from ceramics or glass, include pebbles or rocks to stabilise the arrangements with the added weight… also adding character. Even though when comparing the care requirements of Lucky Bamboo with other house plants make it appear to be ‘easy’, you must not think that they are indestructible. They are still a living thing and as such will not be able to look after themselves without your help. You must take care of its basic needs or it will eventually turn yellow get sick and die. Hopefully this won’t happen to yours, I just wanted you to be aware that it does actually need some care to ensure its survival. I have provided full instructions on how to maintain them at the maintenance of Lucky Bamboo page. Follow the instructions given there and you can be sure to own one that will be healthy and survive for some years with the simple care for indoor bamboo plant tips. You will be able to acquire Lucky Bamboo in garden centres or nurseries but I find buying online is a good way to get a wider choice, particularly with the different arrangements available.